My fascination with historic buildings all started from a book that my housemate lent me, titled “Honolulu: Then and Now”. It actually sat on my nightstand for a while, until I accidentally found myself taking a self-guided walking tour of the historic part of downtown. Yes, I was lost … both literally and in a deeper sense, feeling a little misplaced experiencing reverse culture shock after having spent the past 9 or so years in Asia and trying to adjust back to the U.S.–but a different kind of U.S., on the Islands. 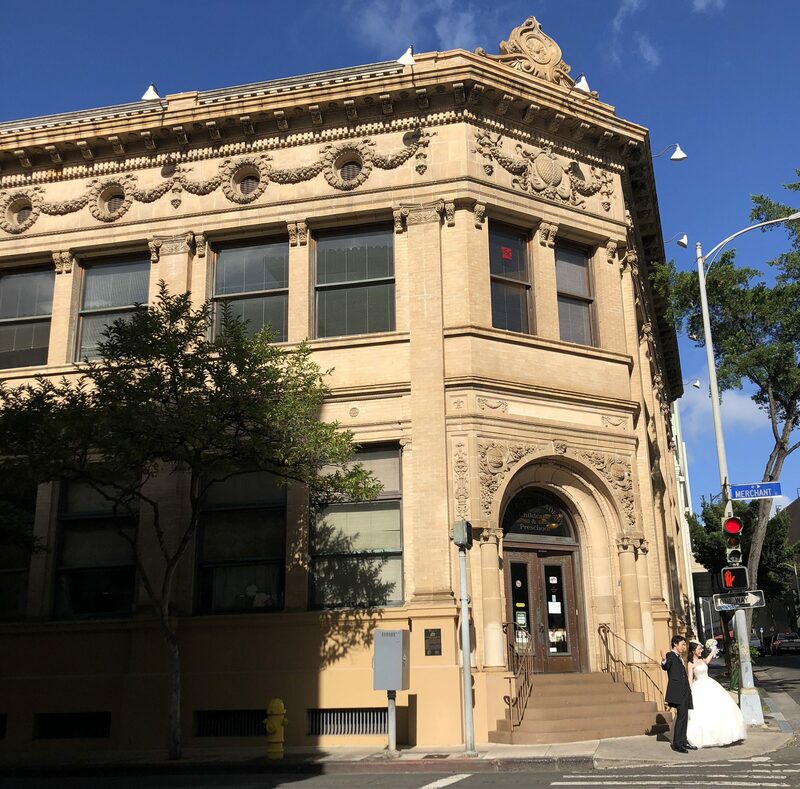 Then, one day I found myself on the edge of Chinatown and there was a couple taking wedding photos in front of this gorgeous building with ornate architectural detail that looked like pineapple-etchings. Definitely unique. I started taking photos too. Then noticed the plaques on some of the buildings identifying their historical value. I found joy knowing that I would be able to find these buildings in my book and learn more. 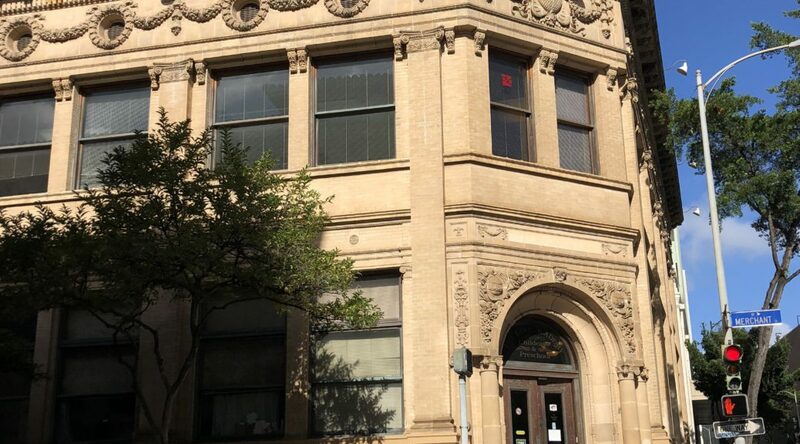 I started to discover the gems that were built in the early 1900s and some even from the late 1800s. 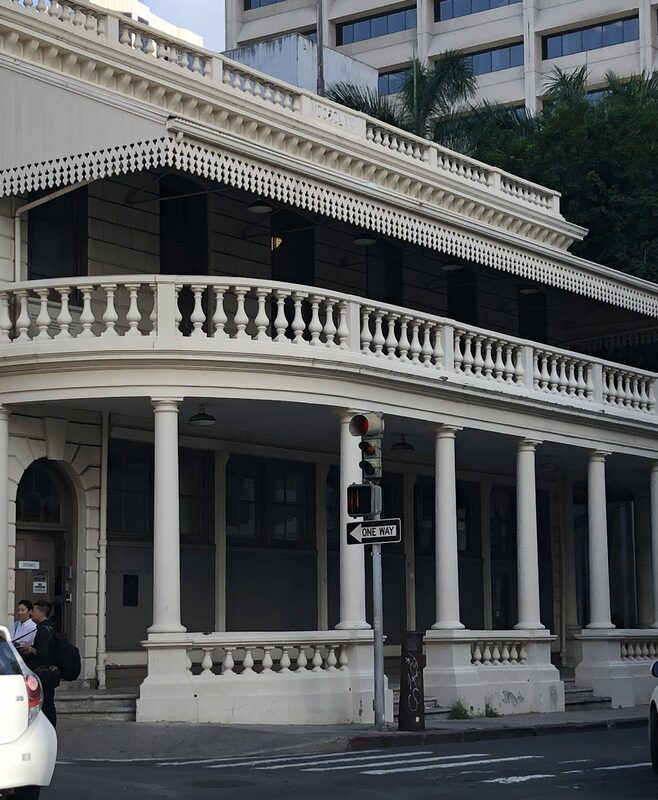 It has grown my appreciation for the strict regulations that aim to preserve the cultural and natural resources of the Islands; any building more than 50 years old on Oahu has to undergo an assessment by the State of Hawaii Historic Preservation Division before it can obtain a building permit to be demolished or repaired. 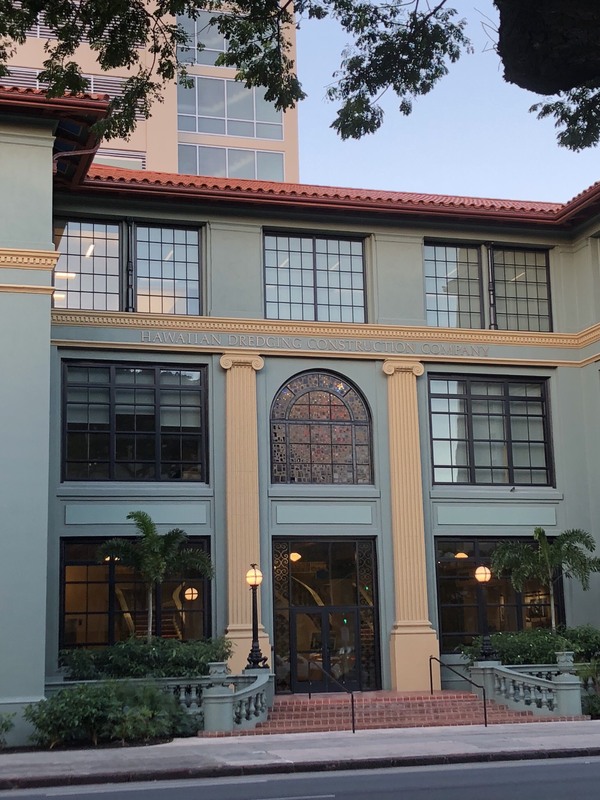 What I love about old historic buildings and architecture is rooted in the same reason I like to spend time with our kupuna*–they have a story to tell. Just by the style of architecture and materials used, one can tell the influence of different cultures and trade of the time the building was constructed. My favorite buildings not only reflect where the architect is from, but combine local materials with foreign styles or blend materials, popular styles of architecture, and technology from different regions of the world. They show resilience and how they have stood the test of time, but also the layers of later additions (of floors, elevators, or other elements) and changes of occupants/uses over the decades. Bae and I were talking the other day about how people with ancestries that have been oppressed historically (or even individuals with experiences of abuse), often hold pain, and (sometimes) shame about the past. 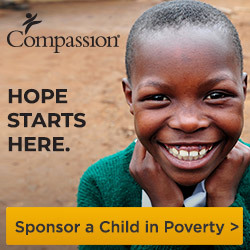 This can breed anger or even people holding grudges or chips on their shoulders for generations to come … but something about retelling, embracing, fully acknowledging and forgiving the past can be restorative and help us redeem what may have been birthed from a place of injustice, abuse, exploitation, misfortune, what-have-you. This rooted from watching David Chang’s episode on fried chicken on the new Netflix series, Ugly Delicious. Good stuff. David Chang, in this documentary series on food and culture, explores the offensiveness of associating fried chicken and watermelon to the American black people whose ancestors endured slavery and blatantly racist Jim Crow laws. Unbeknownst to me, chicken became the default means of survival/sustenance (for food and business) for blacks in the rural South because they were not allowed to own any other type of livestock. The Southern soul food menu almost synonymous to fried chicken and other items (i.e. watermelon, chitlins, etc.) were a product of the unjust societal structure and racist laws that existed at the time. I didn’t realize there were such complex feelings around the recipes that have survived for decades despite their bitter roots. I have long admired people’s resilience and ingenuity to take the situation given them and make the most of it (in this case, amazing fried chicken). This happens time and time again throughout history. My grandmother shares stories about how during the Japanese occupation in Korea, she was not allowed to speak the Korean language; then, when Japan left and they were emancipated, she was reprimanded by public officers for speaking Japanese and not Korean. Although she was deprived of learning Korean history, which she gobbles up now in the form of Korean traditional/historical dramas, there are some beautiful by-products. She has been a successful businesswoman, being trilingual (Korean, Japanese and English); and amongst so many other things like swimming and driving, has been able to teach me Korean/Japanese recipes and hula (the latter being the byproduct of immigrating to Hawaii in her mid-40s). People wonder why so many Japanese restaurants are run by Koreans, but it is a painfully redeemed byproduct of history (like the fried chicken story, of having to learn to cook to cater to the dominant caste of the period). I could go further into the begrudged cultural tensions of Korean and Japanese Americans–i.e. the land and culture wars of Little Tokyo, Los Angeles, but that is another story for another time. The native Hawaiian people were close to completely losing their culture and language, as it was shamed by haole** missionaries, businessmen and sugar plantation owners who took interest in the Islands during the 1800s; some question the appropriateness that its revival of hula and surfing now fuel the tourist industry welcoming more of the outsiders who almost destroyed their culture and decimated their population. In 1993, former President Bill Clinton apologized for the forced abdication of the Kingdom of Hawaii’s throne from Queen Liliuokalani which later led to its annexation to the United States (1898). Although I am a recent transplant and still learning about the history and culture of Hawaii, I am catching on. The native culture promotes the aloha spirit (“love, affection, peace, compassion and mercy” all in their welcoming greeting) and ho’oponopono (Hawaiian code of forgiveness). To me, this is profound and explains the culture here. It is the most multicultural, intermixed place I have ever lived. Even coming from the Bay Area (Santa Clara County, California) where there are many immigrant communities and a high rate of interracial marriage, I have not seen the same level of intermixed, multicultural communities as I do here. The sharp lines that divide ethnic enclaves in San Jose and San Francisco aren’t as clearly defined here. 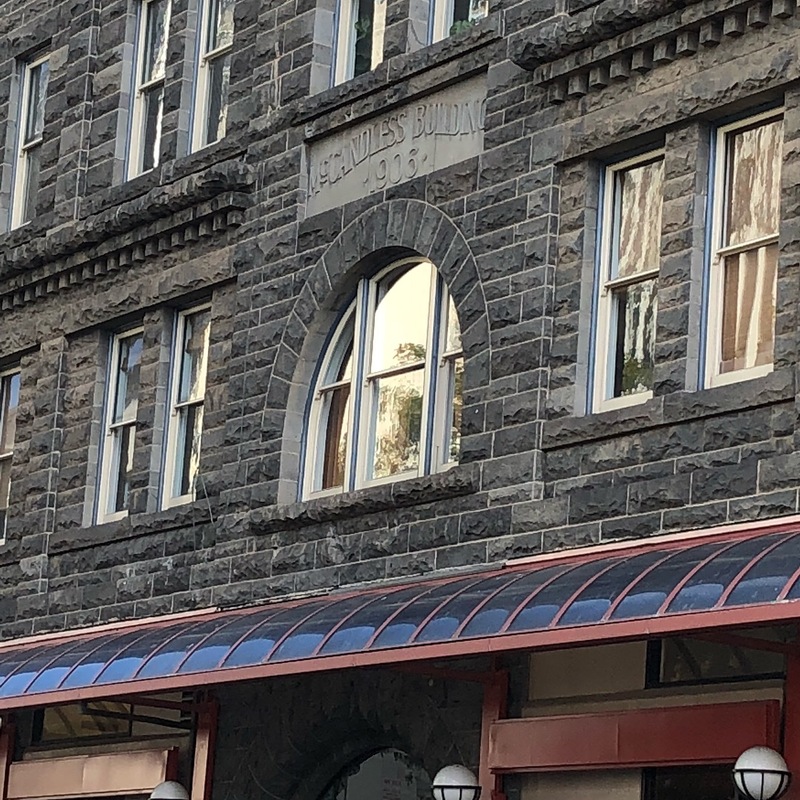 Not to say they don’t exist, but the lines are definitely more blurred … like the mix of styles and materials you find in the architecture of these historic buildings. I don’t see the same tensions between Koreans and Japanese as I do in Los Angeles. This is where I come to understand my grandmother better, who immigrated to Hawaii after experiencing discrimination as a businesswomen and divorcée-single mother in Korea, and prejudice from Japanese Americans in California. 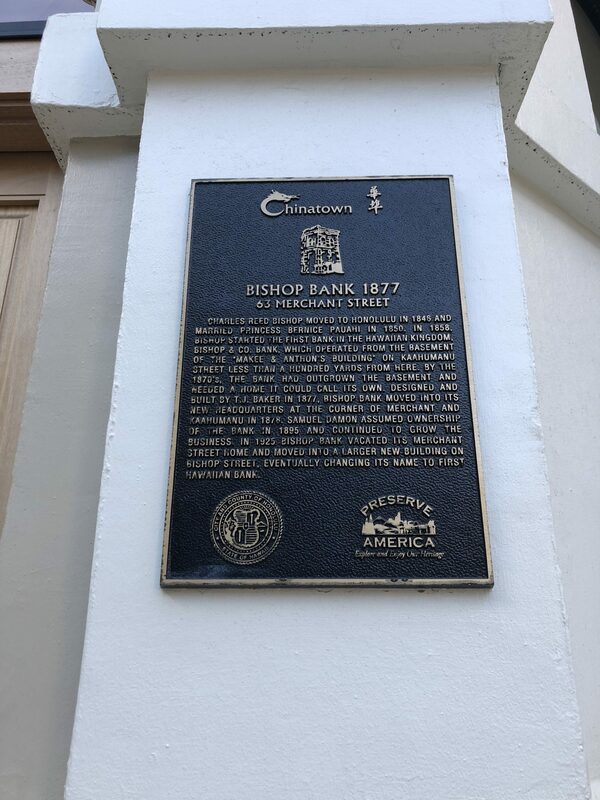 This is where she met her fourth generation Japanese American boyfriend and taught him how to speak the language of his own ancestry–which may have been deprived of him by the aftermath of Japanese internment in America during WWII (similar to the way my grandma was kept from speaking her native Korean). This is where I see redemption of the past and forgiveness comes full circle. Not in forgetting the hardships and pain that our people have gone through because the struggles are real (and continue). But embracing and forgiving humanity (letting go of the anger and shame), and taking from the trials the byproducts or fruit that make us better as a people. I believe this type of restoration, acknowledging history (as well as current events) and offering mercy and forgiveness (just as Queen Liliuokalani was able to keep her faith) allows us to embrace culture into our identity in a healthy way. History can be reconciled. 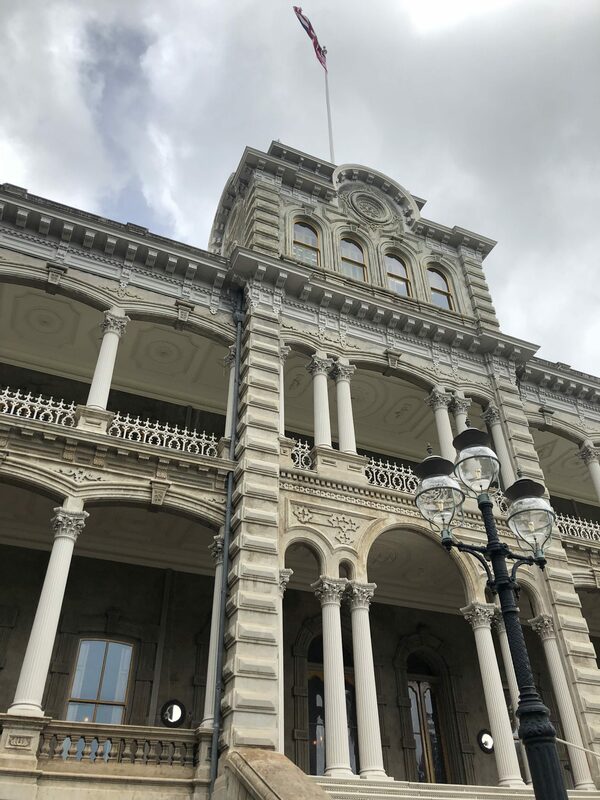 Tying all this back to historic buildings, I pass by the Iolani Palace almost every day, where Queen Liliuokalani was held under house arrest after being dethroned. It was where the first government officials of the U.S. kept their offices until they built and moved into the State Capital across the way. Restored and reopened in 1978 as a museum, it tells a story and has been beautifully kept so foreigners who come to visit today can understand Hawaii better. Understanding and embracing, even the hurtful parts of our history, is part of the healing and restoration so we can reclaim what is truly part of our heritage. Being here is teaching me how to do that. To learn more about the history of the Hawaiian Kingdom, pick up “Lost Kingdom: Hawaii’s Last Queen, the Sugar Kings, and America’s First Imperial Adventure” by Julia Flynn Siler. I haven’t read it yet, but could use a reading buddy or few.